The baseball season is in full swing on FanDuel, and with overlays consistently occurring in the big tournaments it’s a great time to try out daily fantasy baseball. It’s my favorite daily fantasy sport and is as easy and relaxing as going to a baseball game. Before I get into my picks tonight, I want to note that these picks are for FanDuel only. Prices and scoring is vastly different on DraftKings, so these picks will not necessarily be good on DraftKings. But don’t totally rule them out either. Mike Trout (OF, $5,000) – This is quite an obvious pick, but also a must play. Trout and the Angels go to a hitter’s park in Texas and face lefty Ross Detweiler. Trout’s price is actually pretty reasonable at $5,000, and he has the added bonus of facing both a lefty and a low strikeout pitcher. Trout strikes out in over 25% of his ABs, so facing a pitcher in Detwiler, who should only average about 5 SOs per 9 innings this season, means a lot more balls in play for Trout and therefore even better production at the plate. 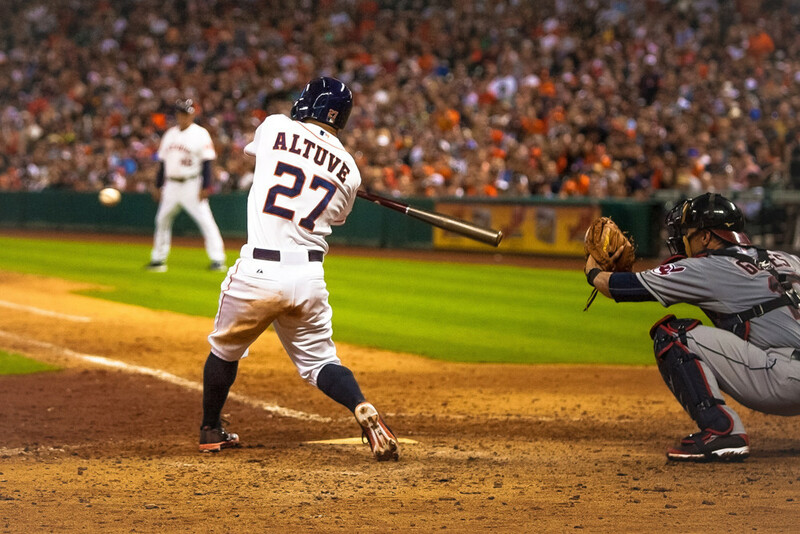 Jose Altuve (2B, $4,000) – Scott Kazmir is a very good pitcher, but he’s actually a great match up for Altuve. Kazmir has massive pitching splits, serving up a .334 wOBA to righties while holding lefties to only .285 wOBA in his career. He’s also not great at holding basestealers as a lefty, he possesses a mediocre 0 rSB. An elite basestealer like Altuve will have an easy time swiping a few against Kazmir, and the match up ensures he should get on base a couple times. He’s one of the best plays at 2B tonight. Albert Pujols (1B, $3,800) – Pujols is a great play here for the same reason as Trout, but he has the added benefit of a great price. Even at $3,800, Pujols is one of the best values of the day. Chris Iannetta (C, $2,300) – Seeing a theme here? The Angels as a team are projected to do very well by online sportsbooks, and although Iannetta should be near the bottom of the order, his price makes him a fantastic play at catcher. He’s also a high strikeout guy like Trout and will benefit from Detweiler’s inability to strike batters out. Asdrubal Cabrera (SS, $2,700) – Asdrubal goes to a great hitters park in Toronto and his price is too low for a .700 OPS player batting 3rd in the order. He also has crushed R.A. Dickey in his career, going 4/9 with 2 HRs and 1 2B with 0 SOs. Will Venable (OF, $2,200) – Watch for the Padres lineup to make sure Venable is leading off like yesterday. His price as ridiculous for a .700 OPS leadoff hitter, and he actually has a reasonable base stealing matchup against Rubby De La Rosa (-1 rSB). Sadly, there’s not a high salary pitcher today that warrants using a min-priced player like Venable, but he will be low-used and a fantastic GPP play. Stolen bases are invaluable on FanDuel, worth a whopping 2 points apiece. Finding great stolen base matchups is a combination of locating pitchers who are poor at holding runners, catchers who are poor at throwing out runners, and pitchers with a high WHIP who allow fast players to get on base. Find a match up with all three of these factors, and you have a player guaranteed to get you those SB points. Eric Young Jr. (OF, $2,500) – Going against Mat Latos (-5 rSB) and likely Jarrod Saltalamacchia (-5 rSB), Young will have a great opportunity every time he gets on base to steal. Mat Latos was horrible in his first start of the season. If he continues to struggle, Young should have an absolute field day on the base-paths. Lefty Jace Peterson ($2,200) is a great option as well batting 2nd for the Braves. Sam Fuld (OF, $2,800) – Fuld gets a great matchup with Scott Feldman (-9 rSB), who is one of the worst pitchers in baseball at holding baserunners. Fuld isn’t an elite basestealer by any means, but this should certainly add to his value and his price is already great at $2,800. Erick Aybar (SS, $3,100) – Many players will use Aybar today because the Angels are projected to do so well. But he’s actually not a great value at SS, and I prefer a player like Asdrubal Cabrera over Aybar. If you stack Angels but leave out Aybar today, it should pay off nicely in GPPs.